www.photomacrography.net :: View topic - FAQ: What is "pupil ratio" and why would I care? Posted: Sat Jan 09, 2010 12:47 am Post subject: FAQ: What is "pupil ratio" and why would I care? Pupil ratio, also called "pupillary magnification factor" or just "pupil factor", is the ratio of diameters between the exit and entrance pupils of a lens. Pupil ratio is important because it affects how a lens behaves when it is extended for close focus. If you rely on experience and experiment, then pupil ratio is not very important and can be ignored for most purposes. You can safely skip the remainder of this discussion. If you use calculations to predict effective aperture, depth of field, exposure factor, or diffraction effects, then ignoring the pupil ratio can result in significant errors. This posting may help avoid to those. I’ll start with a quick summary of results, then back those up with some discussion that complements what can be found in books and web pages. The f-number system for rating camera lenses is based on focal length divided by diameter of the entrance pupil. By itself, this gives an accurate indication of effective aperture only when the lens is focused at infinity. When you extend a lens to focus closer, there is a standard simple formula to predict what happens: f_effective = f_nominal*(magnification+1). However, this simple formula is in fact too simple. With many lenses, adding extension causes the effective aperture to change either faster or slower than the simple formula predicts. Because diffraction, DOF, and exposure correction all depend on the effective aperture, this means that as you extend such lenses to get higher magnifications, they act as if they had larger or smaller apertures than indicated by their rated f-number. This sounds like the situation might get arbitrarily complicated, but it is a curious fact that one additional number provides everything you need to know. That number is the PMF -- "pupillary magnification factor" or just "pupil ratio". The details of measuring and calculating with PMF are described in gory detail below. But the essential intuition is simple: when you extend a non-reversed lens to get higher magnification, its effective aperture depends more and more on diameter of its exit pupil rather than on diameter of the entrance pupil that is the basis for its rated f-number. The notation that I’m using here follows Lefkowitz in “The Manual of Close-Up Photography” (1979), page 258. P is the pupil ratio, computed as rear pupil diameter divided by front pupil diameter. f_r is the rated f-number of a lens. This is the value that’s marked on the aperture ring of a manual lens. It’s computed by the manufacturer as focal length divided by the diameter of the entrance pupil. f_e is the effective (working) f-number, as seen by the camera. m is magnification, measured as image size divided by object size. TDF is total depth of field, including both in front and behind the focus plane. C is the maximum tolerable circle of confusion, measured in the image plane. f_e = f_r*((m/P)+1) gives the effective (working) f-number for an extended lens used in its non-reversed orientation, that is, in the same orientation that the manufacturer used to determine f_r. When other calculations such as DOF, exposure factor, and diffraction are expressed in terms of f_e, then incorporating P into this one equation is all that’s needed to account for its effects. 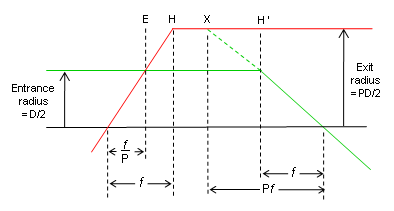 f_e = f_r*(1/P)*(1+(Pm)) gives the effective (working) f-number for an extended lens used in its reversed orientation. Note that f_r in this equation is still the number determined for the non-reversed orientation. The number f_r*(1/P) can be recognized as the effective f-number of the lens at infinity focus but reversed, with the usual “rear” pupil then acting as entrance pupil. Note that when P=1, both equations simplify to the commonly used form f_e = f_r*(m+1). Notice also that when m=1, both equations give the same value. In other words, at m=1 the working aperture is not changed by reversing the lens. TDF = 2*C*f_r*((m+P)/(P*m*m)) gives the total depth of field for an extended lens used in its non-reversed orientation. TDF = 2*C*f_r*((1+Pm)/(P*m*m)) gives the total depth of field for an extended lens used in its reversed orientation. Again, f_r is still the number determined for the non-reversed orientation. Again, when P=1 both equations simplify to the well known TDF = 2*C*f_r*((m+1)/(m*m)), and when m=1, both equations give the same value. Maybe yes, maybe no -- it depends on what you mean by “exact”. Here’s a more precise way of asking the same question: Remember that the classic equation f_e=f_r*(m+1) is significantly wrong for lens designs that have unequal pupils. Does f_e= f_r*((m/P)+1) completely account for differences in lens design, or does it omit other important features also? The answer is that f_e= f_r*((m/P)+1) completely and exactly accounts for lenses that follow the “thick lens model”. This means it’s pretty good for most lenses other than fisheyes. To see why this is true, let’s briefly review how apertures work. The effective (working) aperture of a lens really depends on the relationship between the entrance pupil and the object, or equivalently, between the exit pupil and the image. 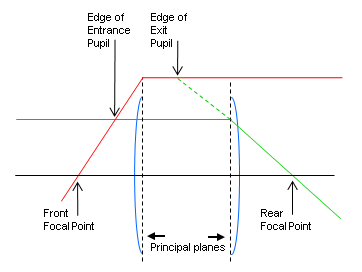 In the simple “thin lens” model often used for illustrations, it happens that both pupils coincide with the aperture, and all of them occur at the single reference point from which focus is determined. This situation leads to the usual formula that f_e=f_r*(m+1). Real lenses are more complicated, but most real lenses behave very much like a simple “thick lens” in which the thin lens’s single reference point for focus is just replaced by two points, one for measuring distances from the front and one for measuring from the rear. Using the “thick lens model” (see HERE), it turns out that the locations of pupils with respect to the focus points are completely determined by the ratio of pupil diameters. As a result, formulas that incorporate the pupil ratio can completely describe how a lens behaves, at least to the extent that the real lens conforms to the thick lens model in the first place. Each ray (one red, one green) represents the apparent position of the limiting aperture as seen from a different viewpoint. On the front, both rays pass by the edge of the entrance pupil, and the location and size of the entrance pupil can be determined by triangulation using those rays. Similarly the location and size of the exit pupil can be determined by triangulation using rays on the rear. I’ll spare you the tedious details, but continuing forward from here, we can eventually reach the formulas listed earlier, as well as the ones shown at toothwalker.org. Tying this into another good page at http://photo.net/learn/optics/lensTutorial, note that the distance from H to E is f-f/P = f*(1-1/P). On that page, this distance is called “zE”, and as they say, “It can be shown that zE = f*(1-1/p)”. Yep, just did that. Again, the main point of this discussion is only that the pupil ratio really does exactly capture everything that matters about asymmetry in a lens, at least to the extent that the lens obeys the thick-lens model. Personally, I find this surprising. In fact I was far from convinced that the equations involving P were exact and complete, until I drew the diagram and wrote up the analysis given here. It’s a nice feeling when things finally “click”. I hope this helps somebody else too! Please let me know if you see any errors in this posting. It's a lot of math to get right. PS. As a dedicated fan of telecentric lenses, I have to warn you that the whole concept of pupil ratio falls apart with them. But that’s a topic for another day. Edit, March 14, 2011: added quick summary. How do I measure pupillary magnification factor? I've heard mentioned at arm's length works... trying to get close enough to replicate the actual distances used for shooting isn't quite possible for a macro lens or microscope objective because I can't see the whole aperture at 15mm from the front and the view from the back would need to be something like 200mm away so the magnification would be completely different. Assuming arm's length is OK, I just snap two shots front & rear without changing the focus ring/bellows extension, right? then crop those to get number of pixels wide & divide those back/front. I got a little different numbers for a foot away vs 2 feet away in one case. Hmm, OK, not much different though I guess. Or, take a photo of a scale in the scene, if focus/magnification changes for some reason. Making the measurement can be a bit tricky because you need to see the aperture and be able to either avoid or compensate for parallax errors in taking the measurement. The "arm's length" technique is fairly accurate for many lenses because their entrance pupils are located only a few cm away from where the scale is held. That is much shorter than distance to the eye, so the parallax errors are small. If you're lucky or careful, you can even get both pupils to be the same distance behind the scale, in which case the error is the same for each pupil and cancels out when you take the ratio. But with most lenses, an even better way to take the measurement is use a shallow DOF macro setup. Focus on one pupil at any convenient distance and magnification, and take a picture. Then without changing the camera's focus, reverse the lens being tested, move it back and forth until the other pupil is in sharp focus, and take a second picture. Because both pictures were taken at the same scale, you can calculate pupil ratio using pixel counts without even needing to know what the measurement in mm is. Of course if you care about the measurement in mm, say to verify f-number, then you can photograph a ruler at the same scale also. Both approaches run into problems as the pupils move farther away from the lens center. With sufficiently asymmetric lenses, you may not be able to make an accurate measurement. For example in the extreme case of a telecentric lens, the entrance pupil is infinitely large but also located at infinity. Both the measurements and the math get very weird in this case. The "arm's length" method gives nonsense numbers, and the "shallow DOF" method has to be carried out as a thought experiment because after you're done focusing the entrance pupil at infinity, you can't physically carry the lens that far away to measure the exit pupil. If the lens has an adjustable aperture, then you can also stop that down to facilitate seeing it from both the front and the rear. If the lens does not have an adjustable aperture, then things can get challenging. It's pretty common, for example, that the full aperture of a microscope objective cannot be seen except from a position near its normal focus point, some few mm in front of the objective. Sometimes I see it written that lenses with pupil factor = 1 can be used either way around "because they're symmetric". Having a pupil factor different from 1 definitely says that a lens is not symmetric. But most lenses that have pupil factor = 1 are still not symmetric. Here is an example, tweaked from one of the WinLens designs (WLDG009.SPD). Unless a lens is designed to work optimally at 1:1, it probably incorporates some asymmetry to get better correction of aberrations. Thanks for the good tutorial. It is clear the results apply to both illumination and diffraction at the image plane. It might also be the case that a retrofocus wide angle lens must have a pupillary ratio of at least Registry.distance/Focal.length. Because if no glass can enter the mirrorbox and the focal length is less than the registry distance, there must be at least (R-f) distance between the principal plane and the aperture's image. Yes, that sounds correct. Good observation. Pupil factor doesn't matter much when a lens is focused near infinity, or when it's reversed and used at high magnification. For example, suppose the pupil factor is P=2 (rear diameter divided by front), and the magnification is 6.
f_e = f_r*(m+1) = 5.6*(6+1) = 39.2 . There's less than 8% difference between 36.4 and 39.2, so clearly pupil factor is not making a big difference in the calculation here. One way of thinking about this is that pupil factor makes its biggest difference when a lens is dragged far away from its infinity focus position, where the sensor is close to the rear of the lens. This applies when you just extend a lens without reversing it. But when you extend and reverse the lens, you bring it back into something close to its normal focus position, except now with the subject close to the rear of the lens. In that arrangement, the lens's working f-number is again close to its rated setting, except now from the standpoint of the subject, and from there the exact rule applies that effective f-number on the camera side is equal to effective f-number on the subject side multiplied by magnification. In practice, the biggest effect with an ordinary camera lens occurs around 1:1, where either you've had to extend the lens quite a bit but haven't reversed it, or you have reversed it but not yet made it closely approach the subject. The other case where pupil factor can be important is with special lenses like the Olympus bellows-mount series, which have significant pupil factors but are designed to be used at high magnification without reversing. Another useful bit of insight is that a lens with different pupil sizes acts like it has a different f-number when it's reversed. For example, suppose you have a 20 mm lens whose filter-side pupil is 5 mm diameter and bayonet-side pupil is 10 mm diameter. Then in its normal orientation, bayonet side toward the camera, the lens would be f/4 (=20/5) with P=2 (=10/5). But when the lens is reversed, the pupils swap places. If we could achieve infinity focus, the reversed lens would act as f/2 (=20/10) with P=0.5 (=5/10). So now, as a crosscheck, we can compare results between the formulas for reversed and non-reversed lenses, using these new values of f/2 and P=0.5 in the non-reversed formula. Plugging in specific values as a test, suppose we use m=5 and physically reverse the lens. These are just two different ways of computing the same physical situation, so the results should be just the same. The fact that they are the same is comforting and provides a bit of reassurance that we haven't messed up the analysis somewhere. Posted: Thu Aug 24, 2017 8:55 am Post subject: What happens for double lens combination? This forum is an eye opener for me and I am having so much insight and learning a lot everyday. In an another post you explained about the double lens combination and changing the aperture on reverse mounted front lens vs the back lens. However I am curious as to what happens to the formulae when we calculate the same pupil ratio with double lens. PS: delete this message if you seem cluttering the beautiful explanation you have already given.